The third component in a plumbing system is the drainage system, more properly called the DWV or drain-waste-vent system, to describe the functions it performs: draining away wastes and venting gases at the same time. Generally, the system consists of the soil stack, the waste pipes, the traps, and the vents. In operation, waste first runs out of the fixtures, say a sink. From there it enters the waste pipes, usually 1½-inch to 2-inch diameter pipes, which are sloped and lead to the soil stack. The stack is a large-diameter pipe that runs vertically from the lowest point in the plumbing system to above the roof and out the roof. 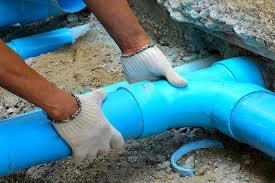 In older homes, 4-inch cast iron pipe is most commonly used. In modern homes, you will find 3-inch copper tube and 4-inch ABS (acrylonitrile-Butadiene styrene) and PVC (polyvinyl chloride) plastic pipe used. The waste then runs down the soil stack, or stack, as it is commonly called, which in turn leads to the building drain, then to the sewer line, which leads to the city sewer line, cesspool, or septic system. 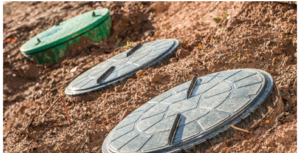 As a safety measure against gases backing up into the house, all fixtures are equipped with traps (van-shaped pipe sections) directly under them, where water is trapped (hence the name trap). These provide a seal against gases and vermin getting into the house through drains. Toilets have built-in traps (toilets also have waste pipes that lead directly to the soil stack). (3) it prevents the backup of water into a fixture that is located below another fixture that happens to be draining.